Occasionally, as an actor, you get a job. Even more occasionally, you get a belter. As a disabled performer, I have watched many versions of The Elephant Man from afar, never considering that one day I might play Joseph Merrick. So when Bristol Old Vic and its theatre school suggested collaborating on the play with our company, Diverse City, I was overjoyed. Following Mat Fraser’s brilliant portrayal of Richard III at Hull Truck last year, this was another chance to reclaim an iconic, disabled role. I have expended far too much time and energy debating the problem with “cripping up”. But it is particularly pertinent to The Elephant Man, with its themes of the fear of difference, the gaze of others, medical and spiritual intervention, the interplay of pity and empathy, and how we reflect ourselves in others. These issues are negated if “putting on a disability” becomes the focal point. “Blacking up” has been consigned to history, while “cripping up” remains de rigueur, and is often a shortcut to industry gongs. The list of excuses for such lazy and offensive casting is pitiful. My recent favourite was that the scene and costume changes were too quick for a disabled actor. Churlish though it is to engage with such ridiculousness, I am unable to resist. We can put a man on the moon, but the collective creative enterprise of director, designers, wardrobe and Velcro are unable to solve this conundrum. Maybe the many dips in my own career have in fact been due to my perceived inability to deal with the quick change? Let’s put that record straight: I have been known to remove my clothes very quickly when required. This facetious example should not obscure the deeper offence of “cripping up”. My impairment is part of who I am, one of many characteristics. I am as complex, flawed and nuanced as the next man. The actor’s role and skill is fathoming these depths, presenting character, rather than caricature. “Cripping up” debases and disconnects, because the cloak of impairment – often physical extremes – becomes the driver, while the characteristics that underpin us all, and indeed drama itself, become secondary. Audiences are turned into voyeurs of difference with a “there but for the grace of God go I” pity, which replaces the empathetic, dramatic journey. This plays into an “us” and “them” dynamic, a binary construct that bears little relationship to our embodied experience, whether disabled or non-disabled. It is deeply uncomfortable as a disabled man to be cast in the role of “them” by default: this is simply not the world I inhabit. “Cripping up” means that disability becomes the defining feature, little more than a dramatic construct on which to hang a tale. Having said all this, I sincerely hope I keep my side of the bargain by doing a good job. All the signs for our production of The Elephant Man are good. Director Lee Lyford is a joy to work with, and the graduates and team of the Bristol Old Vic Theatre School have expelled all my gnarled cynicism. How I wish I was embarking on their careers, rather than wheeling out my age-worn theatrical anecdotes. I have been involved in a lot of training around diversity and disability at drama colleges and, in many ways, our performing arts training institutions lag behind the wider industry. The few disabled graduates coming through are in greater demand than their non-disabled counterparts. However, once in a rehearsal room, we quickly understand that people working together is not rocket science, and differences in bodies, experiences and aesthetics enrich the process and production. I have had a brilliant experience thus far. Now, an audience. 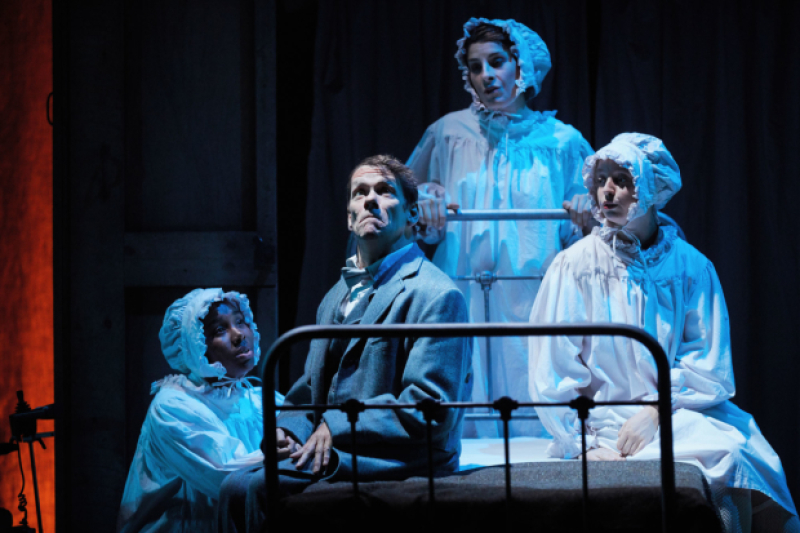 The Elephant Man is at Bristol Old Vic until 7 July.